Shane Helmich is the 7th and 8th grade PLTW teacher at Olive Peirce Middle School in Ramona, CA. He teaches Design & Modeling and Automation & Robotics courses, incorporating 3D printing into each. Kristine Mostyn is a Librarian at Lee-Whedon Memorial Library in Medina, NY. The library has an Afinia H479 3D printer and recently acquired an Afinia ES360 3D scanner. Philip Youngblood teaches the Intro to Engineering Design and Biomedical Science classes at Central High School in Keller, TX. He recently won the Afinia H480 3D printer after attending a PLTW conference. Brian Miles is the Computer Technology Teacher & Technology Integrator at Middleton Cross Plains Area School District. He’s passionate about finding new ways to use technology for learning and exploring. 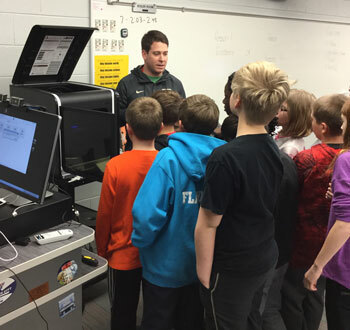 Miles talks with his students about the H800 and 3D printing technology. Sean Huxter is an avid “Afiniac” who uses his H479 and H480 3D printers to create impressive toys and collector accessories, innovative household improvement pieces, and thoughtful gifts.